Ballistics -'the study of the dynamics of projectiles. b. The study of the flight characteristics of projectiles. 2. a. The study of the functioning of firearms. b. The study of the firing, flight, and effects of ammunition.' Ballistics is the science of mechanics that deals with the motion, behavior, and effects of projectiles, especially bullets, gravity bombs, rockets, or the like; the science or art of designing and accelerating projectiles so as to achieve a desired performance. A ballistic body is a body which is free to move, behave, and be modified in appearance, contour, or texture by ambient conditions, substances, or forces, as by the pressure of gases in a gun, by rifling in a barrel, by gravity, by temperature, or by air particles. A ballistic missile is a missile designed to operate in accordance with the laws of ballistics. 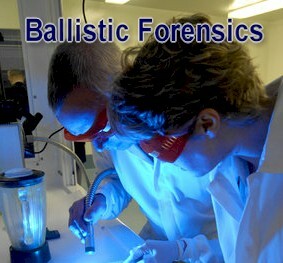 In the field of forensic science, forensic ballistics is the science of analyzing firearm usage in crimes. Internal ballistics, the study of the processes originally accelerating the projectile, for example the passage of a bullet through the barrel of a rifle. Transition ballistics, (sometimes called intermediate ballistics) the study of the projectile's behavior when it leaves the barrel and the pressure behind the projectile is equalized. External ballistics, the study of the passage of the projectile through space or the air. Terminal ballistics, the study of the interaction of a projectile with its target, whether that be flesh (for a hunting bullet), steel (for an anti-tank round), or even furnace slag (for an industrial slag disruptor). Forensic ballistics involves analysis of bullets and bullet impacts to determine the type. Separately from ballistics information, firearm and tool mark examinations involve analyzing firearm, ammunition, and tool mark evidence in order to establish whether a certain firearm or tool was used in the commission of a crime. 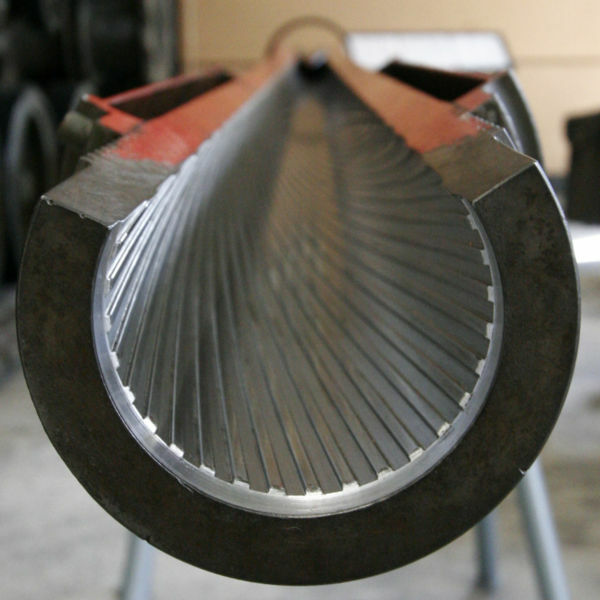 Rifling, which first made an appearance in the 15th century, is the process of making grooves in gun barrels that imparts a spin to the projectile for increased accuracy and range. Bullets fired from rifled weapons acquire a distinct signature of grooves, scratches, and indentations which are somewhat unique to the weapon used. The first firearms evidence identification can be traced back to England in 1835 when the unique markings on a bullet taken from a victim were matched with a bullet mold belonging to the suspect. When confronted with the damning evidence, the suspect confessed to the crime. Calvin Goddard, physician and ex-army officer, acquired data from all known gun manufacturers in order to develop a comprehensive database. With his partner, Charles Waite, he catalogued the results of test-firings from every type of handgun made by 12 manufacturers. Waite also invented the comparison microscope. With this instrument, two bullets could be laid adjacent to one another for comparative examination. In 1925 Goddard wrote an article for the Army Ordnance titled "Forensic Ballistics" in which he described the use of the comparison microscope regarding firearms investigations. He is generally credited with the conception of the term "forensic ballistics," though he later admitted it to be an inadequate name for the science. In 1929 the St. Valentine's Day Massacre led to the opening of the first independent scientific crime detection laboratory in the United States. Asub-category of firearms examination, is a forensic method that is intended to help find the gun that was used in a crime by matching the bullet's striations (or striae) with the rifled barrel through which it was fired, or by matching marks on the cartridge case to marks in the chamber and breech. The technique is part of the science of forensic ballistics, and it is an application of toolmark identification. The term ballistic fingerprinting, a comparison to the use of fingerprints in forensics, is more commonly encountered by the public. 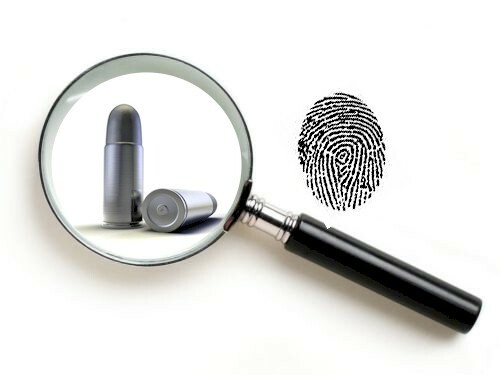 The basic application of the technique is for forensic firearms examiners to examine the bullet or cartridge case evidence and reach a conclusion about common origin (typically restricted to "yes," "no" or "maybe"). The simplest considerations, class characteristics, are the gross differences; a 10 mm bullet, for example, could not have been fired from a 9 mm barrel, nor could a .357 Magnum cartidge have been fired from a .38 Special revolver (although a .38 Special could be fired from a .357 Magnum revolver). The rifling in the barrel also varies among manufacturers and models, in number and shape of the grooves, twist rate, and direction. Colt, for example, traditionally uses a left-hand twist, while Smith and Wesson uses a right hand twist; a current production M16 rifle uses a 1 in 7 inch twist, while most civilian AR-15s and the current Mini-14 use a 1 in 9 inch twist. Marlin Firearms use a distinctive 16-groove Micro-Groove rifling in many of their firearms, while the M1903 Springfield rifle had two, four, or six grooves depending on the manufacturer. Examiners can often quickly narrow down the make and model based on these variations; while they cannot say with a high degree of certainty that "gun A" fired a given bullet or case based on this information alone, they may be able to say that "gun A" did not fire a given bullet or case. As all manufactured items have inevitable variations, it is often possible for a forensic firearms examiner to match a bullet or cartridge case to a particular firearm based on these variations. Most often these are due to marks left by a machining process, which can leave shallow impressions in the metal which are rarely completely polished out. Wear due to use will also cause each firearm to acquire distinct characteristics over time, though this same process will also alter the "fingerprint" of the firearm. If recovered, cartridge cases are often easier to identify than bullets. First, the parts of a firearm that produce marks on cartridge cases are less subject to long-term wear, and second, bullets are often severely deformed on impact, destroying much of the markings they acquire. Ballistic Evidence can play a crucial role in a forensic investigation. It can help lead the scientist to the trajectory of the bullet as well as the firearm that shot the bullet. Famous cases where ballistic evidence was crucial in the investigation have been the John F. Kennedy assassination and Son of Sam murders. Recently the Federal Bureau of Investigation has come under scrutiny because of their technique used to match a bullet used at the scene of the crime with a suspect?s firearm and unused cases of ammunition. The most common current use of computer-based ballistic fingerprinting is to match cases or bullets found at various crime scenes to one another, to provide connections for police to use in investigations. A human firearms examiner must examine the actual evidence for a conclusive match, but even a probable match can help police look for additional evidence in areas they would not otherwise have considered. Some localities, particularly Maryland, have attempted to build up a large database of "fingerprints"; in the case of the Maryland law, all new firearms sales must provide a fired case from the firearm in question to the Maryland state police, who photograph it and log the information in a database. The Maryland State police have written reports critical of the program and have asked the Maryland General Assembly to cut off funding for the program since it has not contributed to solving a single crime, and has simply been a drain for taxpayers, and police resources. A California Department of Justice survey, using 742 guns used by the California Highway Patrol as a test bed, showed very poor results; even with such a limited database, less than 70% of cases of the same make as the "fingerprint" case yielded the correct gun in the top 15 matches; when a different make of ammunition was used, the success rate dropped to less than 40%. California has passed a bill AB 1471 which requires all new models of handguns to be equipped with microstamping technology by 2010. There is also a possibility that the owner of a weapon might replace the barrel (if it is worn out, for example), which will change the fingerprint. As mentioned above, use will add wear marks to the firearm, which will alter the fingerprint by obscuring some existing marks, and creating new ones. Temporary changes in fingerprinting are also possible. Specifically, it is possible to buy a replacement barrel for most firearms--often for as little as US$20 for a used part. It is possible to replace the barrel in many firearms, especially semi-automatic handguns, in minutes, with no tools. This barrel may be used in a crime, then removed just as quickly. Ballistic fingerprinting of bullets does not work at all with firearms such as shotguns that fire shot-containing cartridges. In many cases the shot rides inside a plastic sleeve that prevents it from ever touching the barrel, and even in cases where the shot does touch the barrel, the random movement of the shot down the barrel will not leave any consistent marks. 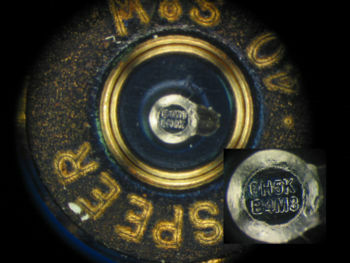 Firearm microstamping, ballistic imprinting and ballistic engraving are all names given to a technology that engraves a unique identifier onto a firearm's cartridge under the pressure of firing. This information is intended to be used to connect fired cases from a crime scene with a particular gun, and allow a trace subsequently to be run on empty cartridges found at the scene of a crime. A new technology, ballistic imprinting has not been implemented by any firearms manufacturers, but has been subject to intense political debate by various groups. The newer ballistic imprinting technology, patented by Todd Lizotte and presently owned by ID Dynamics, uses microscopic engraving on the firearm to record information about the firearm; generally make, model, and serial number, and serve to identify a firearm uniquely. In the method most often proposed, the identifying marks are engraved on the face of the firing pin which then stamps the primer both as the firing pin impacts the primer to ignite it, and as the chamber pressure pushes the primer back into the firing pin. By marking the replaceable primer rather than the reusable case, each time a case is reloaded the new primer supplies a fresh writing surface upon which to accept the identifying engraving. If one or more fired cases from a ballistic imprinting firearm is/are left at a crime scene, it should be possible to obtain the unique firearm ID from the case(s), and trace the gun from the manufacturer, to the distributor, to the dealer, and to at least the first retail customer. 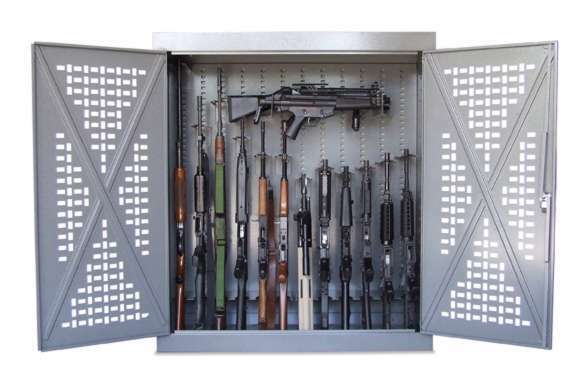 In the case that a FFL dealer is used to transfer the used gun from one state to another state, it could even be possible to trace a fired case found at a crime scene to additional owners of the gun, at least until such time the gun is sold in a state where no FFL transfer agent is required. Still, at this point the paper trail becomes less reliable, since private firearms sales are not regulated in most states. Once a transfer has occurred between private individuals in jurisdictions where this is legal, prior owners of a firearm may not be able to provide any significant information on subsequent private buyers or sellers. Supporters of legislation requiring ballstic imprinting technology hope that the paper trail will be sufficient to allow gathering evidence in some crimes, and also allow better tracking of firearms from manufacturer to any criminal, perhaps leading to arrest(s) of straw purchasers.